After a scrumptious grilled cheese sandwich from Simplybread (Cluny Court), I had just enough space for ice cream so I walked over to Taste Matters located a few doors away. I really liked the place because the pastry chef was so passionate about what he did (visited previously for his lavendar ice cream). I could literally hear excitement in his voice as he introduced me to all his offerings. This time was no different of course. 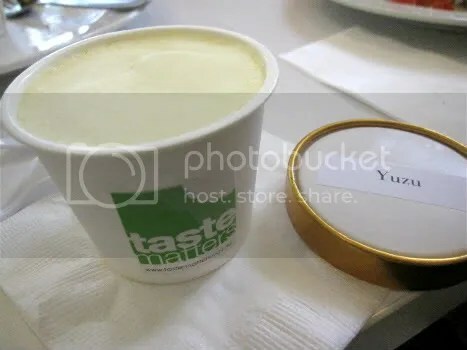 He saw that I was quite reluctant to get scoops of ice cream- well, I have to smuggle it into Simplybread where my friends were because TM has no seats :P- so he recommended his yuzu ice cream which now comes in small petit tubs. Perfect. Cheaper plus it’s easily transportable! The yuzu was really acidic in a good way. 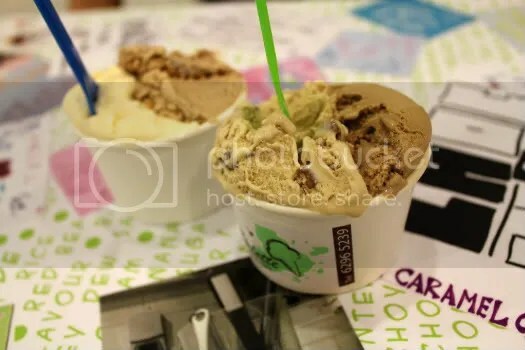 The best thing is TM serves it as an ice-cream, not a sorbet like what the restaurants usually do so you get the creamy flavours with the citrus flavour cutting through it. But I must confess it did get a little overwhelming three quarters through my cup, the acidity I mean. It could have done with some chunks of those chocolate fudge cookies I saw him baking while I was there. Yes, if he embedded some into the ice cream to offset the acidity I think that would have been perfect. I mean, what better pairing is there besides chewy dark chocolate cookies with sour and smooth yuzu ice cream? In essence if you are a purist, go for the yuzu ice cream. You’ll love it. Whenever I’m in the Raffles City/Bugis area i’ll always find an excuse to go Tom’s Palette. Fortunately the friend didn’t need much persuasion after being so impressed during his first visit with me. Buttered pecan and Earl Grey were both fantastic. I wanted to type “they are my new favourites” but you know what, I should just stop creating a category of “favourites” for TP since almost everytime I go I’ll find a new “favourite”-.- Prices went up a little (can’t remember by how much coz the friend treated) but it’s due to rental. We can’t complain about the bigger shop space where we are almost guaranteed a seat (unlike last time) can we? ?